Peter J. Burns III: Who Would Guess Having Too Much Cash Is Such A Problem?! So...barely a month ago I embarked on yet another start-up...www.gogreenbanking.com. I do what I do best-connect the dots, pool resources, and launch. It's my tried and true (for me) version of "Ready, Fire, Aim." I chose to enter the remarkably untapped niche vertical that I call "Cannabis Banking." I already had a successful FinTech product, the "Entrepreneur Credit Card" (www.entcreditcard.com/imagine) that I simply re-branded for the new start-up as the "Cannabis Card." Joining an old friend in a new venture that his friend had started in the infant world of Cannabis Merchant Account Processing, I combined my "Cannabis Card" and the hereunto now, Cannabis Merchant Account Processing to form Cannabiz Insiders (www.cannabizinsiders.com). The website went up, the training of my force of beautiful and talented Millenials to call upon likely customers (legal - State-wise) dispensaries and growers were undertaken and we started collating the hundreds of likely clients. Soon, I became both enamored and a bit overwhelmed with the intricacies and opportunities of this latest venture. As is most often the case...I started the business first...and then set about to learn about the industry as the novice I am. I sought out market experts and started to learn from the best. My rather unique perspective from having the "fresh eyes" started to serve me well, as it often does. I saw things right away that could solve so-called "impossible" impediments by applying the old "entrepreneurial work-around." Here is what even I am stumped on...so far. The Feds consider Cannabis a Schedule I illegal substance, even though the current $28 Billion (cash) industry is recognized as a legal enterprise in 28 States (and counting). 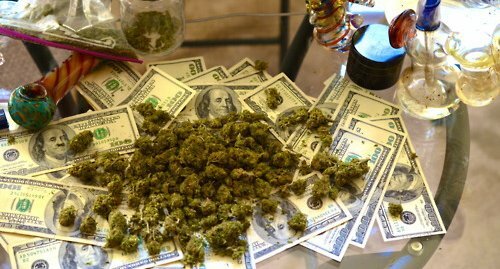 Since the Feds trump the States and control banking, a State-legal Cannabis business cannot open up a bank account, borrow money or process credit cards through an FDIC-insured institution. The obvious problem becomes...what do you do with all of the cash?! Well, through my "Cannabis Card," I can lend unsecured money to the principals of any Cannabis-related business at extremely favorable rates and terms. (See www.entcreditcard.com/imagine). The Cannabis Merchant Account Processing dilemma has now been solved by our partnership at Cannabiz Insiders (www.cannabizinsiders.com). What remains "Today's Challenge" is what to do with the proverbial "Legacy Cash" issue...that is, what do you do with all the money previously earned before a Cannabis business implements our unique "Seed to Software" compliance and accounting system? Another issue becomes...after our Overseas solution of legally processing credit cards from the Cannabis companies and even shortly being able to service the cash proceeds generated from the "Seed to Sale" software and cash vault" service is utilized...how does one legally and logistically re-patriot those accumulated funds from our Overseas banks back home to the USA? We have interim ideas but so far nothing can handle the eventual tens and hundreds of millions of actual hard cold cash available from the hugely profitable Cannabis merchants that are becoming our clients. We need a bank here in the USA willing to take our deposits. A FDIC-insured one won't work...yet. Anyone out there that wants and can take our deposit business? What a problem to have....too much cash!